How to treat Nickel allergy ? And can it be treated? Hypersensitivity to metals like Nickel is very common. Though many people are not aware that they have the allergy, it affects 700 million people worldwide. But how to treat Nickel allergy? And how to deal with Nickel allergy and its consequences? Allergies and hypersensitivity to Nickel are responsible for or involved, in many forms of eczema/dermatitis (also designed sometimes by dermatosis). Contact allergy can lead to allergic contact dermatitis (such as contact eczema) or allergic stomatitis for instance. Systemic allergy drives or is associated with chronic dermatoses or eczemas such as dyshidrosis, atopic dermatitis, baboon syndrome and others. 30-50% people with these forms of eczema are allergic to Nickel… And they often do not know they are unless they did the allergy testing. 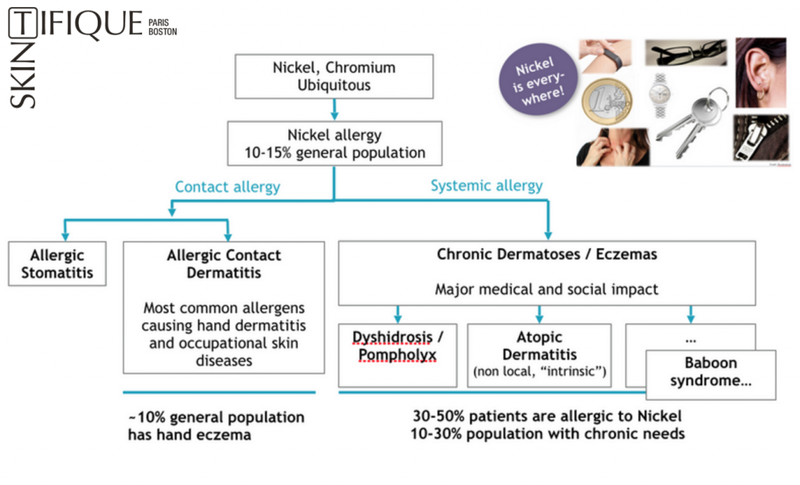 If you are wondering if you may be suffering from one of these variations of Nickel allergy, you can have a look at our article about Nickel allergy symptoms. In this article, we will focus on possible treatments for contact allergy and in particular allergic contact dermatitis. For systemic allergy, another article will be published soon. According to Mayo Clinic: “Once you develop a sensitivity to Nickel, you will develop a rash (contact dermatitis) whenever you come into contact with the metal”. Typically, these reactions are local. For instance, it can be on earlobes because of costume earrings, on the wrist because of a watch or bracelet containing Nickel or on the belly for a jean with metal buttons. It can also be at work, e.g, if you are a healthcare worker, a hairdresser, a construction worker, a mechanic, or in many other professions. It is what is called allergic contact dermatitis. If you are interested in a great article to know more about contact dermatitis, you can click here. Which medications can help me with my allergic contact dermatitis? It is not possible to treat Nickel allergy, but here is some advice to deal with it. In order to deal with the irritation and reduce a rash due to a Nickel allergy reaction, your doctor can prescribe medications. Most often topical creams or oral treatments that contain corticosteroids or antihistamine. Such treatments are usually efficient to deal with the rash, but they are not a good solution in the long term. These medications may have some side effects such as mood swings, weight gain or increased blood pressure. So which companion care and lifestyle can I try when I have an allergic contact dermatitis episode or when my skin is prone to it? 1/ Try to stay away from Nickel. This is very hard considering that every day we come into contact with objects containing metals that irritate the skin such as Nickel. They don’t let your skin breath normally and are not efficient anymore as soon as the film starts to cracks. Some people can become allergic or hypersensitive to the petrol derivated ingredients and bacteria may develop underneath the occlusive barrier. Such petroleum derivated ingredients are not so great for the environment. So, you may consider using the innovative Protective Cream HPS. Using a new, exclusive and patented technology (Capturifique), this product specifically captures Nickel and other common metals on the surface of the epidermis, limiting their penetration into the skin and the harmful effects. Its concentrated and non-occlusive formulation provides up to 14 hours of protection. If you are looking for a product to use over large body areas, you can also try the Moisturizing Lotion HP. This body and face lotion provides stronger moisturizing than the Protective Cream HPS and it also contains the metal protection technology, albeit, to a slightly lesser degree. 3/ Use soothing lotions. In order to ease itching, the Hydrating Gel Plus HS provides triple emollient, humectant, and soothing actions. Using exclusive and patented Activifique technology, the Gel releases its soothing agents (and moisturizing agent, see below) over time and in part “on demand”. This makes the Gel a “smart” skin care that is responsive to the skin and its needs. And it requires much less applications than standard creams. 4/ Moisturize regularly. According to Mayo Clinic: “your skin has a natural barrier that is disrupted when it reacts to Nickel and other allergens. Using emollient creams or lotion could reduce your need for topical corticosteroids”. You can, for instance, try the Moisturizing Lotion HP which is an ideal everyday moisturizer and a great partner to the Protective Cream HPS. This lotion moisturizes the skin deep down and also provides protection against pollutants and contact with objects containing Nickel. Recommended for all skin type and of course for allergic ones, it may also reduce the risk of becoming sensitized to Nickel. You can also try the Hydrating Gel Plus HS that is probably the most efficient moisturizer in the market. 5/ Be careful with your diet. Nutritionists have developed low-Nickel diets, which cut out certain Nickel-rich foods. This is a difficult approach, however, given how common is Nickel. You can learn more about these diets in our article “I have a Nickel allergy… what can I eat?” which you can read by clicking here. You now know more about how to deal with Nickel allergy. Do not hesitate to contact us at [email protected], if you need any information on the products which can help protect your skin from Nickel. Previous PostWhy are Skintifique products specially tailored for sensitive skin?